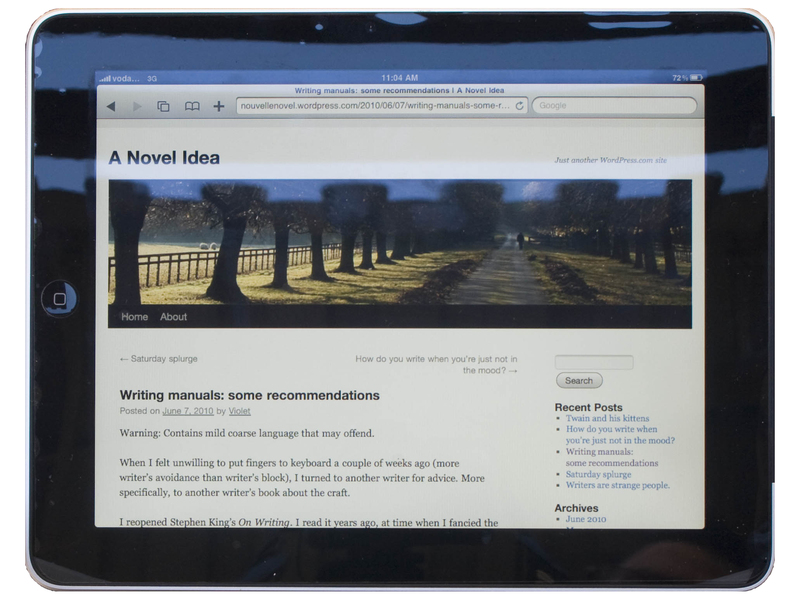 I have had the opportunity to road test a brand new Apple iPad (32GB, Wi-Fi + 3G) this weekend. Playing with new toys is always fun, but this is not just any new toy. This is a toy with the power to transform an entire industry. My friend graciously lent it to me but that won’t stop me from telling you whether they just blew $928 (AUD inc GST) plus data costs or not. Much as Apple’s recent reinvention via iTunes and the iPhone has impressed me, I’m no Apple evangelist. In the interest of providing a fair review, I declare my ownership of at least one Apple device (an iPod Touch). My partner also has an iPhone which is never more than 30 centimetres from his grasp at any moment. I must also reveal that my relationship with Apple extends back into the 80s when I got my first computer – a hand-me-down from a family friend – an Apple ii C. It was boxy way before electronic cubes became fashionable. I credit the Lemonade Stand game for my later business exploits. Back to the shiny new toy. I shall confine myself to the three best and worst features of the iPad. You can google for more extensive, technical reviews elsewhere. I am an avid reader and a lover of books, so I was not expecting much more than an electronic page-turner with the functionality of my iPod Touch thrown in. It is winter in Australia, which I admit is pretty lame compared to a Northern Hemisphere winter. Nevertheless, I am female and I feel the cold. With a book I need both hands out in the cold – one to hold it upright and one to turn the pages. With the iPad one hand can stay cosy under the covers as it only takes one hand to hold the iPad and flick the pages. Brilliant. Whenever I travel, I always end up carting a few kilos of books. I never read the entire selection, but I never find myself bored and unable to switch to a new text. The iPad takes my need for choice and uninterrupted reading to a new lighter level. This iPad has 61 books already (many which were free classics), a bunch of apps and miscelleneous media and still has more than 28 GB free. How many gold medals does Michael Phelps have? What is K Rudd’s all new low approval rating? What is Doraphobia? These are the sort of questions that arise in our household over dinner (judge us as you will). The iPhone is great for a quick web search but the iPad is bigger and better. Here’s a close up of my blog, to give you an indication of readability. One of my greatest pleasures is reading on our balcony or in the park in glorious sunshine. Add a picnic lunch and I’m in heaven. Unfortunately the reflective surface of the iPad is not conducive to reading outside. Added to that I can see myself behind the text – a distraction for even lesser narcissists. Thanks Apple, you’ve just reminded me that my hair is out of control as usual. Won’t the sharp increase in eBooks lead to the cessation of traditional book publishing? Books might disappear! Libraries will be digitised then sold off to property developers…In the last year book publishers seem to have woken up inside a digital nightmare. Thankfully many Australian publishers are looking for the opportunity in the new landscape rather than bracing for the end of the world. I love books – the smell of the fresh new purchase and the well loved musty classic. 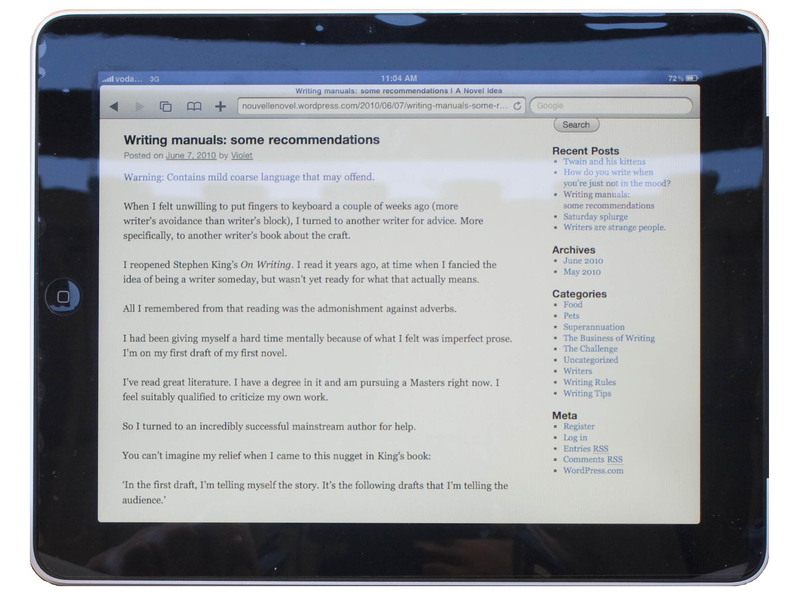 The iPad cannot replace the sensory experience of reading a book. It cannot replace the feel of paper beneath fingers. I do think we will see more people reading electronically and less books published. The iPad questions the dominance of the book form. 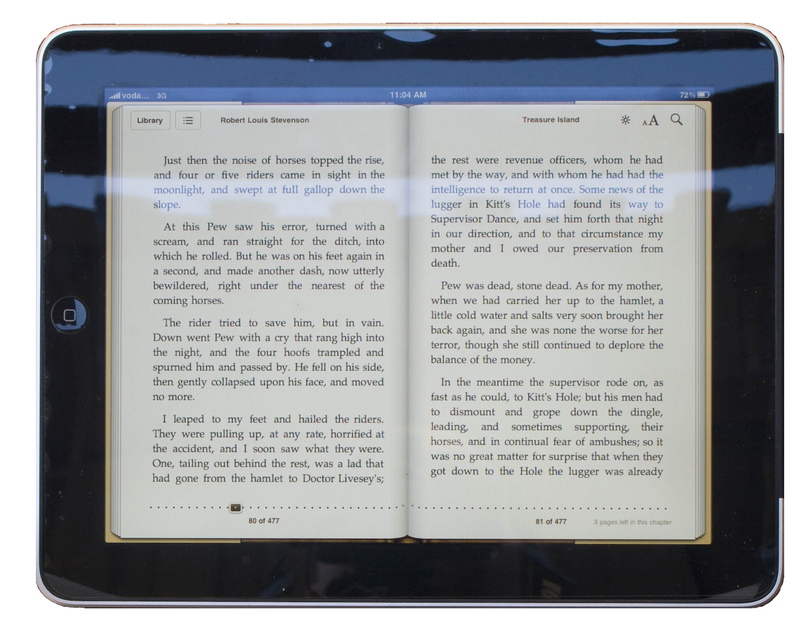 eReaders will reduce the number of printed books. eReaders do not threaten publishing, rather they represent a triumph of story. I want more stories not less. Story tellers have a new distribution channel and a new set of challenges. The iPad is not the apocalypse. It is a new dawn. Is the iPad a waste of money? Not if you can spare it. I have read more in the last few days than in the previous two weeks. I can read on the bus, in a queue, while cooking dinner. Not only can I read downloaded books but I can check newspapers and websites easily on whim. I’m part way through Treasure Island, but I must return the useful device to its owner. Farewell trusty iPad.